Regular readers will know that I am a big fan of designer/Euro/German Boardgames. I am always on the lookout for a group of dedicated (or semi-dedicated) game enthusiasts in the Eastern Avalon area for the purpose of getting together and playing games. I am getting excited about the opening of St. John's first board came cafe! Mochanopoly and Spellbound Gallery is scheduled to open its doors in August at 279 Duckworth Street. Board Gaming has made a great comeback in recent years. 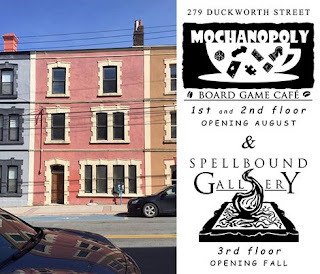 Board gaming has been a spreading tend in recent years in St. John's. I am looking forward to enhancing the social experience of gaming with other like minded people who enjoy a coffee, beer and a few snacks. This is the golden age of board gaming. I love the fact that through great games, blogs, videos and word-of-mouth that board gaming is becoming mainstream. Take the success of Will Wheaton's Table Top Games! Yes, video games might still be king, but the innovative, exciting board games of today are changing that. The rise of smartphones and tablets has introduced players to a way to try digital versions of board games, and many go on to buy physical copies as well. My iPad is full of my favorite board games like: Catan, Pandemic, Ticket To Ride, Cacassonne, Puerto Rico, Small Word, Arigola, Dominion - just to name a few! I find introducing a game via a digital format opens the door to many great social opportunities with real people. It is going to be great to be around folks who know the rules and can teach enthusiasts how to play. Figuring out the rules of some games can be perplexing but knowing that your are going to learn how to play the game right from the start sounds great. I had actually played with the idea of a bookstore/cafe/game shop but could not convince my fellow gaming enthusiasts that the economics were there to make it work. With the age of the geek, the rise in popularity of games that will float any boat and the social engagement, the time is right for such a venture. More games, more gamers and more gaming opportunities. Now if only I can get my wife to be more enthusiastic about my favorite pastime.